In calculus, a limit is defined as the value of a function as it approaches some point. Sometimes, a function has no finite limit at a point because it just keeps growing, and we say the limit is infinite. In this case, the function never reaches the limit but the value grows arbitrarily large as it gets nearer and nearer to the limit. In our reading, I have been considering limits in a different light. I have been thinking about the limits of civilizations as they progress in their development of mathematics. Some civilizations seem to reach a limit of understanding and because of cultural restraints, their limited number systems, or even because they outwardly reject an idea, they stop progressing. Fortunately, sometimes their discoveries shape and influence other cultures and, as a whole, progression continues. I would like to explore different limits in the progress and development of mathematics and consider what limits us today. Plimpton 322. Image: Public domain, via Wikimedia Commons. 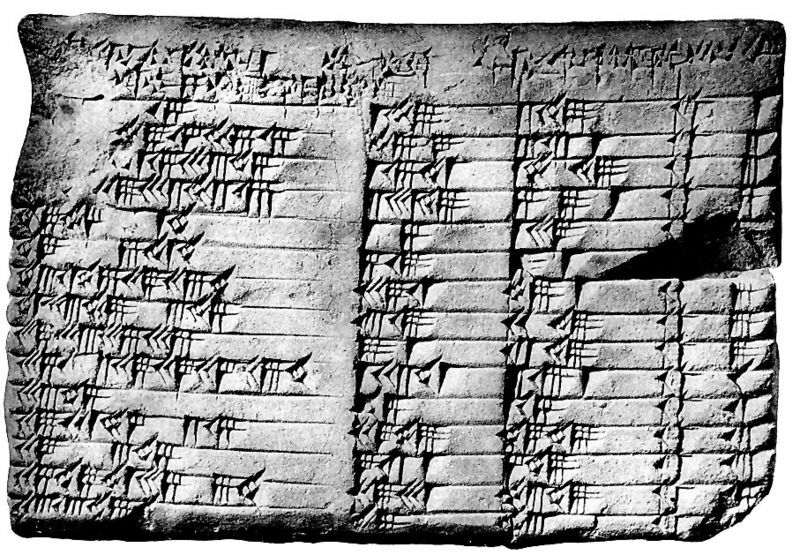 In ancient Mesopotamia, more than 4000 years ago, the Babylonians used the base of 60 to develop a high level mathematical system. They developed positional notation and could use fractions as well as whole numbers. They developed systems to figure square roots. Clay tablets from that time show tables with logarithms, multiplication facts and reciprocal pairs. There is information about calculating compound interest and solving quadratic equations. Writings on the tablets suggest that math was a subject that was taught and studied. In many ways, they seem to have exceeded the capabilities of other civilizations that came much later in history. No one can question that their accomplishments were amazing, to say the least, and perhaps influenced other cultures. However, because most of their mathematics were only for very practical purposes like conducting business, surveying land and constructing buildings, they stopped short of exploring some of the deeper meanings of things. For example, our text points out, “In the Babylonian square-root algorithm, one finds an iterative procedure that could have put the mathematicians of the time in touch with infinite processes, but scholars of that era did not pursue the implications of such problems.” (Merzbach and Boyer, pg. 26) What might have been the implications if they had? As they approached the limit, they stopped rather than exploring the infinite possibilities. They stood on the brink of even greater discovery, but did not pursue it. One of the most dramatic examples of cultural influences limiting the progress of mathematics is the example of the progression of Indian positional decimal arithmetic to Europe. Mathematicians in India had developed a number system with ten digits, including zero, and used it to develop methods of computing fractions, square roots and π. In the tenth century, Gerbert of Aurillac attempted to introduce the system to Europe. He had learned the system first hand from Arab scholars in Spain. However, he was rejected and during this time of the Crusades in Europe, he was rumored to be sorcerer. He died after a short reign as Pope Sylvester II. “It is worth speculating how history would have been different had this remarkable scientist-Pope lived longer” (Bailey and Borwein, 6).” The Indian system was reintroduced 200 years later by Leonard of Pisa, but was rejected again and considered “diabolical”. It wasn’t until the beginning of the 1400’s that scientists began using the system. “It was not universally used in European commerce until 1800, at least 1300 years after its discovery” (Bailey and Borwein, pg. 6). While many other areas of the world were able to do complicated computations using the Indian system, Europe, because of its cultural restraints, was still laboring with Roman numerals. Imagine what the brilliant minds of the Europeans might have discovered or developed if they had the ease of the Indian number system? In this case their culture may have created a limit that kept them from infinite discoveries. Today in our world we have amazing tools to help us progress. Not only do we have the combination of a well-developed number system, thousands of theorems and laws and the knowledge of centuries of learning, we also have technology that assists in remarkable ways. Indeed we have all the tools of the past plus the technology of our day. However, are there things yet to be discovered, or have we reached a limit? Are there obstacles in our society or ways of thinking that limit us? As recently as the early 1900, women had a difficult time pursuing their mathematical interests. Even today, women and minorities continue to be underrepresented in the math and science fields. What might have been the result if woman had been afforded the same educational opportunities as men over the years? Do we limit ourselves by the way we approach math? Are there different number systems or “languages of math”? In recent years, computer scientists have given us other “languages” for coding. Are there similar languages for math? The challenge for our day is to not be content and accept that what has been learned is all there is. In our reading for class I have been amazed at how often a group or civilization is on the brink of great mathematical discovery, but because of varying reasons they stop short of the mark. Sometimes cultural influences limit the progress and other times it seems individuals do not look far enough to find deeper meaning or answers. It is true that hindsight may be twenty/twenty, but I can’t help wondering what future civilizations may look back on and see that we barely missed. What are we on the brink of discovering if only we would look forward and push closer and closer to the undefined limits? Bailey, David H., and Johnathan M. Borwein, “The Greatest Mathematical Discovery?,” 2011. This entry was posted in European mathematics, Indian mathematics, Mesopotamian mathematics and tagged base60, limits, zero on September 18, 2014 by clarkclan2014. Plimpton 322, a text that uses the Babylonian base 60 number system. Image: Public domain, via Wikimedia Commons. There always seems to be so many “why” questions in mathematics. One of the largest mistakes made by educators today is brushing over those “why” questions. As a future educator I wanted to dissect the reason for base 60, so that I can explain to my future students exactly why or at least give them a better answer than “because I said so”. This is why I have chosen to research the theories behind why the Babylonians chose to work in base 60. What were they thinking when they chose that base? We are not the first ones to question the Babylonians’ use of base 60. Theon of Alexandria, fourth century AD, and Otto Neugebauer of the 1900s also tried to answer this question.4 The struggle comes with the uncertainty of the past. No historian has been able to present such a convincing theory that it dismisses all other theories. With that being said, read the theories and pick the one that makes most sense to you and just go with it! Theon of Alexandria originally presented this theory for the reason of base 60.4 This theory states that 60 was chosen because it was divisible by 1, 2, 3, 4, 5, and 6. Therefore, 60 is the smallest number that maximized divisors. Because of the vast number of factors 60 is “easy” to work with.1 I put easy in quotation marks because it is only easy if that’s what you were taught from the beginning! Imagine being taught to work in base 10 all your life and all the sudden you switched to working in base 60 when you got to college. I’m sure you would have some other choice words to describe base 60 that did not include the word easy. The theory of maximization of factors is the most popular of the theories. I am assuming this is the case because it is fairly straight forward in its explanation. This theory was presented by Neugebauer.4 He proposed that the Babylonians chose base 60 based on the weights and measures adopted from the Sumerians. The overall idea behind his theory was that a decimal counting system was modified to base 60 to allow for dividing weights and measures into thirds. After research we can find that the system of weights and measures of the Sumerians did use 1/3 and 2/3 as basic fractions. My complaint with this theory is that the systems of weights and measures would have come prior to determining the base. I feel as if the determination of a base would have come prior to the system of weights and measures. But that’s just my humble opinion. These theories have to do with basic geometry. The Babylonians knew that there were 365 days in a year. However, when creating a circle, they chose to have the degree of a circle equal 360°. This was a choice made out of convenience because 360° was simpler to work with than 365°. The Babylonians then used a standard ruler and compass to construct a hexagon inscribed in a circle. This hexagon allowed for 6 partitions measuring 60° each.3 This theory was presented by the historian of mathematics Moritz Cantor.3 The reasoning behind choosing a hexagon is still fuzzy to me. The other coordinating theory was based on the importance of the equilateral triangle to the Sumerians. Sumerians considered the equilateral triangle the “fundamental geometric building block”.4 Perhaps the reason the Sumerians thought the equilateral triangle was so important was because of the connection between it and the hexagon inscribed in a circle discussed earlier. An equilateral triangle has angle measures of 60°. Was the choice of base 60 as easy as that? The astronomical theory was quite simple. The number 60 is the product of 5 and 12. Babylonians believed there were five planets at the time; Mercury, Venus, Mars, Jupiter, and Saturn.4 They also believed there were 12 months in a year. Could base 60 have been the obvious choice because of those two important numbers? Could it be that they counted the segments of their hands? We are all familiar with the idea of counting fingers and even toes, but counting pieces of fingers? That seams odd. This theory was very confusing for me. When you count the segments you get 12 on each hand. That gives you 24 pieces in total. That doesn’t tell me anything about 60. But apparently there is some further explanation. “One can count up to 60 using your two hands. On your left hand there are three parts on each of four fingers (excluding the thumb). The parts are divided from each other by the joints in the fingers. Now one can count up to 60 by pointing at one of the twelve parts of the fingers of the left hand with one of the five fingers of the right hand. This gives a way of finger counting up to 60 rather than to 10. Anyone convinced?”4 I am most certainly not convinced. Unfortunately, I was unable to identify who originated this method. Joined forces is the name I gave to a theory proposed by several historians. This theory states that there were two civilizations prior to the Babylonians. One civilization worked in bases 5 and the other civilization worked in base 12. Another possibility is that one civilization worked in base 6 and the other in base 10. Either way, when the Babylonians joined with these other civilizations, they decided to compromise with the previous civilizations. The compromise was decided by multiply to two previously used bases together to get base 60.3 “One of the nicest things about these theories is that it may be possible to find written evidence of the two mixing systems and thereby give what would essentially amount to a proof of the conjecture.”3 I will not dive into how they chose base 5 or base 6 or base 10 or base 12 in this post. The last intriguing possibility is that either a ruler or a committee made the decision to use base 60. I think this theory along with a combination of another theory is very plausible. I believe that there was a committee of scientists and mathematicians that researched base 60. After the research of base 60 and other basses, the committee met with the hierarchy. The hierarchy could have been a political leader or the leader of the educational system at the time. After comparing the pros and cons of base 60 along with other bases, the hierarchy and committee chose the base that would be used in mathematics from then on. There is the argument that changing a civilizations number structure by committee creates a mess. Remember, America trying to switch to the metric system? It didn’t end well. Nevertheless, math didn’t come from this magical land. It has origins and theories discovered by real people. I believe that if we discuss these origins and the thought process behind the theories more students will have an interest in mathematics. This entry was posted in Mesopotamian mathematics and tagged base60, math, theories on September 7, 2014 by liadelp.